Grab your friends and find your inner Van Gogh while you help raise funds for Eden Animal Haven! Painting with a Twist will donate 50% of your admission fee to Eden Animal Haven, plus a generous donor has offered to MATCH what Painting with a Twist donates! Your registration fee will make twice the impact with helping cats and kittens in need! AND you will be able to create and bring home your own masterpiece! This will be a great evening to have fun with your friends, or meet new friends; relax or just let your hair down and be you; or simply discover your inner artist. No artistic skills required, although we do ask that you bring a smile, and a desire to have fun and help animals in need! There will also be raffles and items for auction, as well as limited food and beverages. 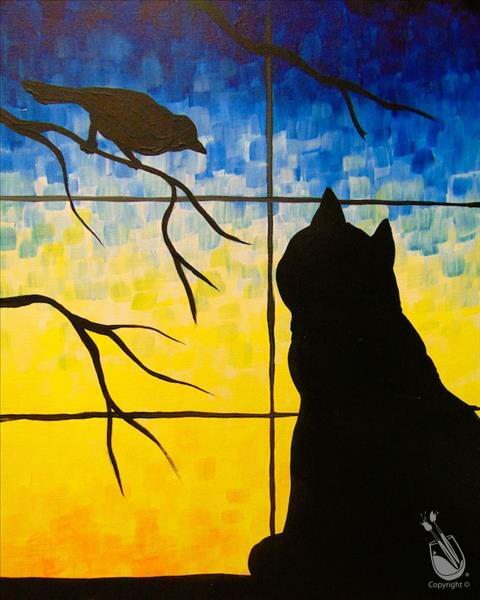 You are also welcome to bring your own favorite bottle of wine or beverage as you paint along with an instructor to create your own "CURIOSITY" CAT that you will take home at the end of the evening. You must RSVP and purchase your ticket through Painting with a Twist. Seats are limited and we must get 20 reservations to get to the 50% donation level, so make your reservations now!